Will US lift arms ban to get access to Viet port? CAM RANH BAY (Vietnam) • The ghosts of the Vietnam War have finally faded at the strategic port of Cam Ranh Bay. More than 40 years ago, United States forces left this massive base, where marines landed, B-52s loaded up for bombing raids, and wounded US soldiers were treated. Now, some Vietnamese say they yearn for the US military to return. "On Facebook, there was a question recently: What do you want from President Obama's visit?" said Mr Vo Van Tao, 63, who fought as a young North Vietnamese infantry soldier against the US. "Some people said they wanted democracy. I said I wanted the Americans to come back to Cam Ranh Bay. A lot of people agreed with me." President Barack Obama is due to arrive tomorrow in Vietnam, the third visit by a US president since the war ended. The big question he is expected to answer is whether Washington will lift a partial arms embargo and allow Vietnam to buy lethal weapons from the US. The Communist government has long asked for the ban to be revoked, and US access to Cam Ranh Bay could be part of the payoff. For the White House, the decision on lifting the embargo has come down to a debate over trying to improve Vietnam's poor human rights record versus enabling Vietnam to better defend itself against an increasing threat from China in the South China Sea. Washington has for years made lifting the ban contingent on Vietnam's improving human rights, and has prodded Vietnam to allow more freedom of speech and to release political prisoners. But as tensions with China have escalated in the South China Sea, the sentiment in the Obama administration has shifted towards lifting the ban, US officials familiar with the discussions said. Vietnam's needs dovetail with those of the US, which has been encouraging maritime states in South-east Asia to better defend themselves, an effort partly aimed at keeping the US from being dragged into a direct naval conflict with China. 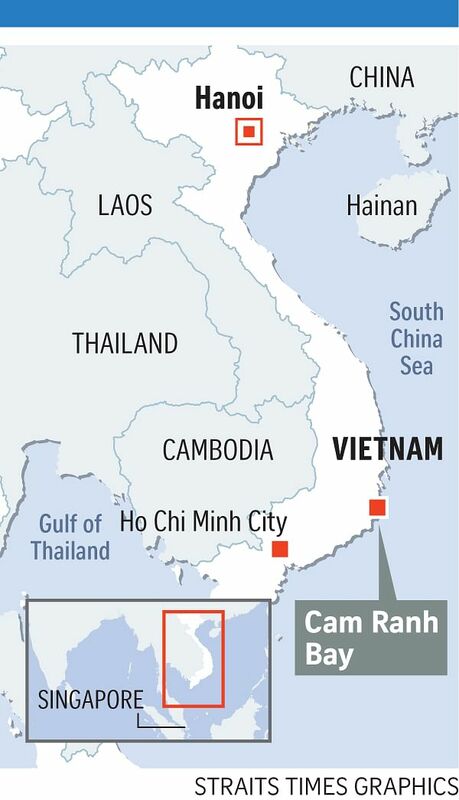 The prospect of access to Cam Ranh Bay, where the Vietnamese have built a new international port, provides another enticement for lifting the ban. A US presence there would allow its forces to use the port on the western edge of the South China Sea, complementing facilities in the Philippines on the sea's eastern edge. "If the United States can get regular access to Cam Ranh Bay, it would be very advantageous to maintaining the balance of power with China," said Dr Alexander Vuving, a Vietnam specialist at the Asia-Pacific Centre for Security Studies in Honolulu. "If something happens in the South China Sea, it takes a while for the US to get there. China can get there more quickly." The Vietnamese have made it clear they would not entertain exclusive use of the facilities by the US but would allow it to share the base with others. Singaporean and Japanese vessels this year were the first to use the facility. But the human rights side of the equation remains problematic for a country that Human Rights Watch describes as one of the world's most repressive. Last week, the US assistant secretary of state for democracy, human rights and labour, Mr Tom Malinowski, met human rights leaders and government officials in Hanoi for a final human rights assessment before Mr Obama's visit. The US State Department said he urged Hanoi to "release political prisoners without condition" and make other improvements.